Coffee mug stand that I like to call Cup o' Java. 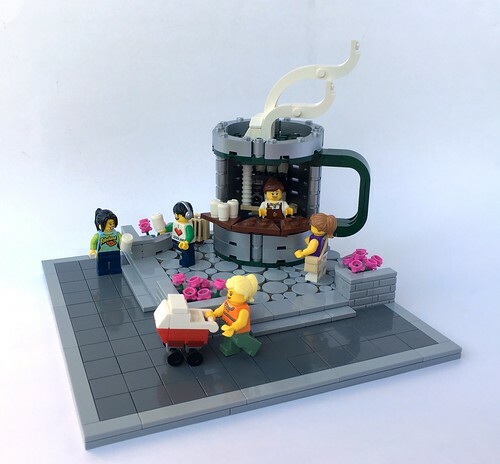 It's minifigure scaled and it's in shape of a coffee mug. Features: Espresso coffee machine, cups, counter and a place for the barista minifigure. Color scheme: Dark green and metallic silver to resemble Starbucks color scheme and I like the color combination, but one can change the colors to whatever else suits you. Instructions: Simple to build. LDD file for instructions to allow for easier color swapping. Tip: When swapping the metallic silver for another color due to dwindling available stock of the macaroni brick (part 48092), you may also swap the round 1x1 brick (part 3062b) for 1x1 square brick (part 3005). Currently part 3005 does not come in metallic silver. Staging: See image for possible display one can built. I like to think it would fit nicely on a busy corner lot.